Bring the Spirit of Exploration into Your Classroom with resources and opportunities from NatGeoEd.org! Download our own high-resolution illustration of Earth’s interior. Teachers, scroll down for a quick list of key resources in our Teachers’ Toolkit. The Earth is divided into three main layers: the dense, hot inner core (yellow), the molten outer core (orange), the mantle (red), and the thin crust (brown), which supports all life in the known universe. Download a PDF version this poster here! 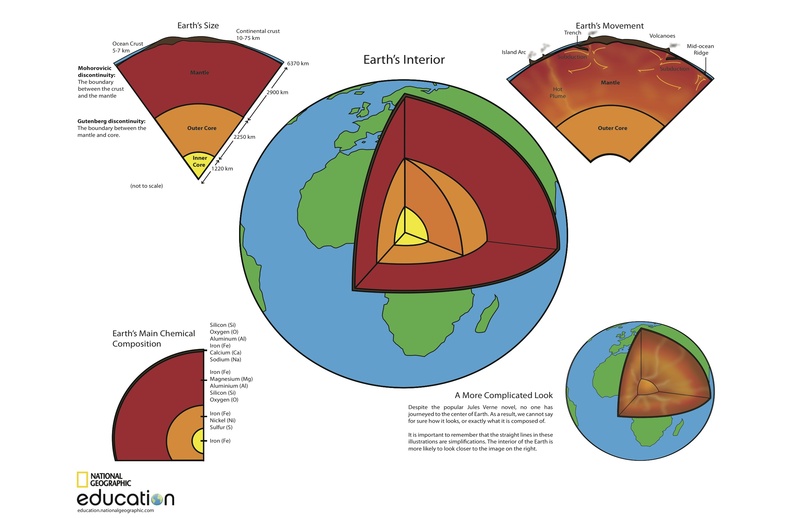 Scrolling through the fantastic BBC interactive graphic of Earth’s interior, it seems like the crust takes up a lot more room than the mantle or core. Just the opposite is true in our own illustration of Earth’s interior, which shows the upper and lower mantle—not the crust—as the thickest layer in Earth’s interior. Why is there such a difference? Take a look at the bottom of the “Journey to the Center of the Earth” interactive graphic. It shows distance and scale. As you scroll down, you can see the scale going from large-scale to small-scale. Near the surface of the Earth, one pixel represents about .002 meter (2 millimeters). That leaves a lot of room for information about drilling, diving, and metal detectors. At the deepest place yet reached by people (hi, James Cameron! ), one pixel represents one meter. Toward the center of the Earth, one pixel represents 2,500 meters (2.5 kilometers). At this scale, you can move through the entire core in one swipe! The BBC graphic drills deep into the earth and dives deep into the ocean to show “what lies beneath” the surface. At about 10 meters (33 feet), the graphic starts to note how divers may experience “nitrogen narcosis,” a phenomenon similar to alcohol intoxication. People living and working at the same depth in solid ground don’t experience this phenomenon. Why? Although nitrogen and oxygen have narcotic effects at high pressure, helium doesn’t. Divers often incorporate helium into their tanks of breathing gas in mixtures known as trimix (which mixes oxygen, helium, and nitrogen) and heliox (which mixes oxygen and helium). Both our graphic and the BBC’s “Journey to the Center of the Earth” note the Mohorovicic discontinuity and the Gutenberg discontinuity. (Learn more about the Moho here.) What’s being discontinued? What is the “Moho”? What’s the Gutenberg discontinuity—and why is it called the CMB? The Mohorovicic discontinuity is the boundary between Earth’s crust and mantle. The Moho is not a uniform line—it’s about 5 to 10 kilometers (3–6 miles) below the ocean floor, and 20 to 90 kilometers (10–60 miles) beneath continents. Nat Geo: What is Earth’s core? Nat Geo: What is Earth’s mantle? Nat Geo: What is Earth’s crust? When i need more about this can you send it to me please cos i liked it and ready it. How Big is a Blue Whale’s Heart? How Do Hummingbirds Survive the Winter? What Does This Have to Do with a Mission to Mars?